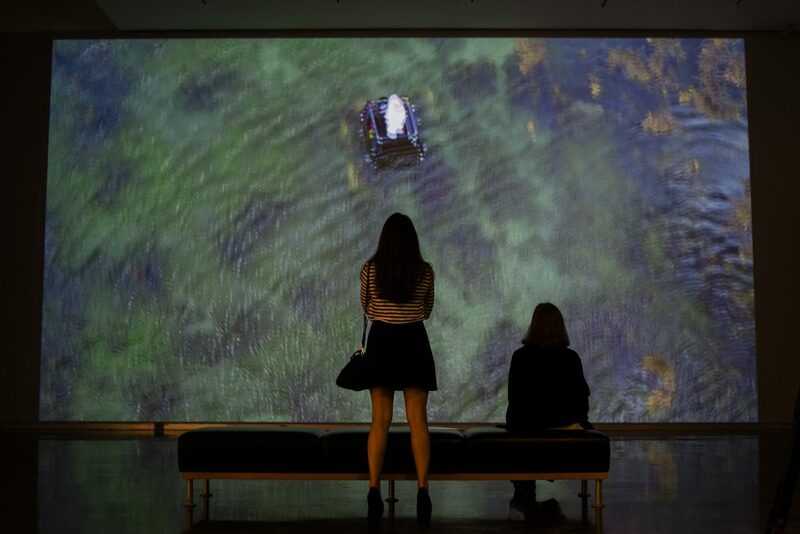 Art professor Malcolm McClay’s exhibition Swimming to Inishkeel, which debuted in Donegal, Ireland in early 2018, opened at the LSU Museum of Art in Baton Rouge November 1, 2018. 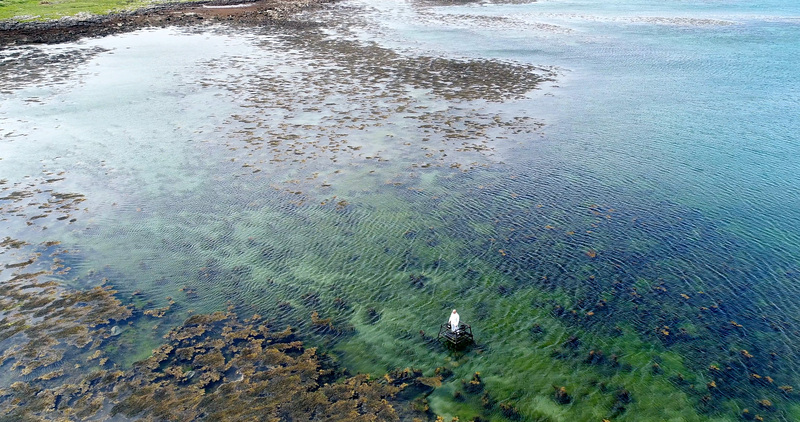 Swimming to Inishkeel presents recent multi-media, sculptural, and performance work by Professor McClay, including static and kinetic sculpture, photography, film and performance. 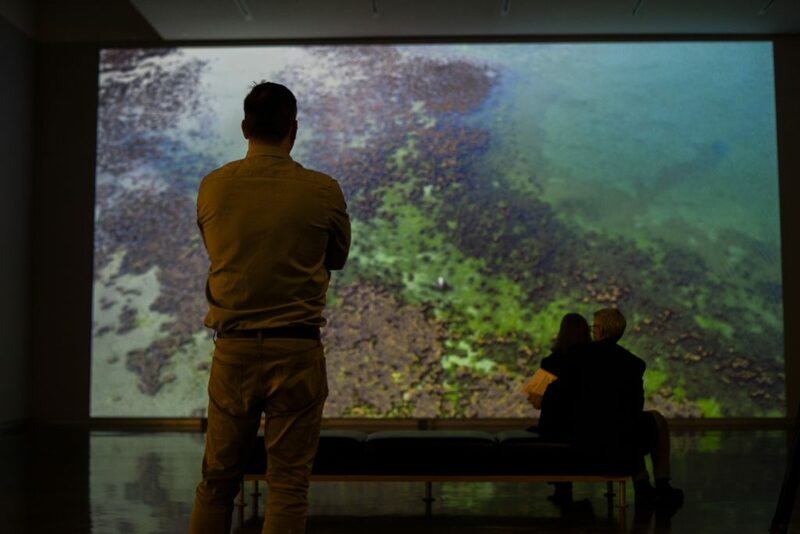 The exhibition features video installations of Professor McClay’s performance art, conducted in the tides off the coast of Ireland. 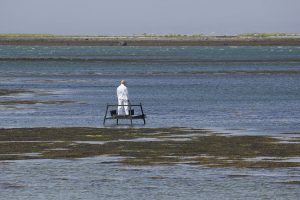 The Chasing the Invisible installation joined sculpture and performance art; Professor McClay constructed a 10-foot steel tower in the Galway Bay, while the tides rose around him. 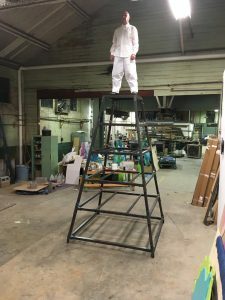 Aerial video footage documented his performance: after having built the steel tower against the wind and waves, he stood on the top platform, all dressed in white, a solitary figure out in the overwhelming expanse of ocean. 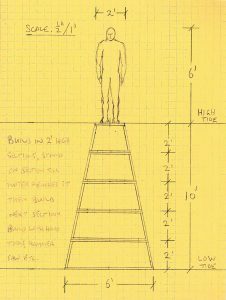 “On a chance visit to Malcolm McClay’s studio at LSU, I found myself studying preparatory sketches, tide tables, and calculations,” wrote Courtney Taylor, LSU Museum of Art curator. 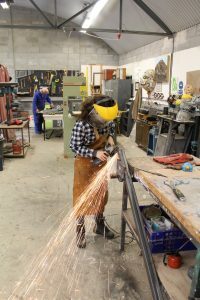 Art students Griffin Gowdy (BFA candidate) and Matthew Barton (MFA 2017) helped Professor McClay to construct the tower in Ireland before the performance, spending hours welding the steel lengths and fitting them to form the structure. 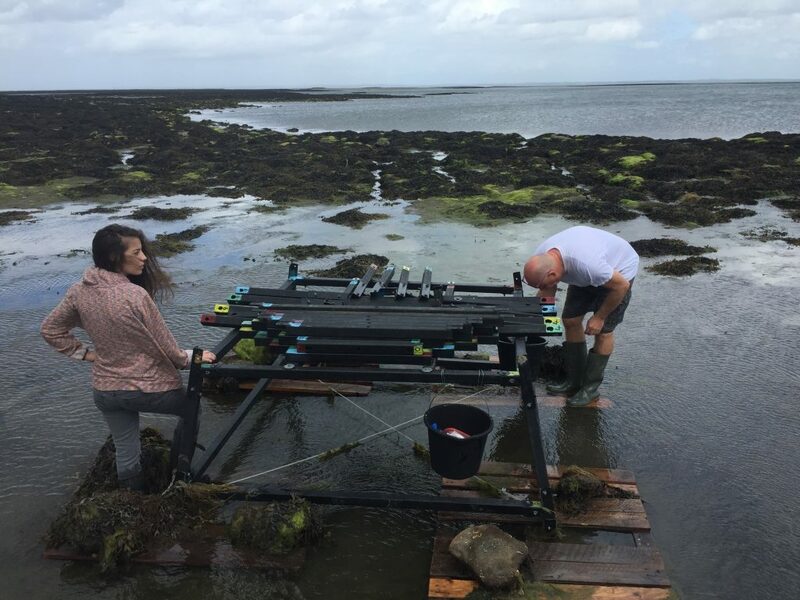 The team searched for the perfect site for the performance, scouring the coastline for a place that would meet the requirements. In the spot they ultimately chose, the tide rises 10 feet, and they had to determine how to install the tower without it flipping over in the strong ocean current. 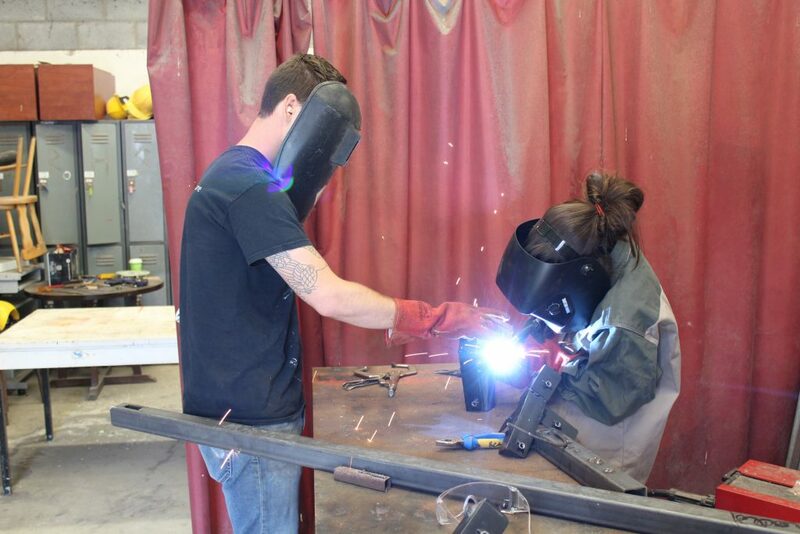 To install the piece, the team carried armfuls of steel parts roughly 50 yards out to the selected spot, scrambling across slick ocean rocks, slippery with kelp, their boots sinking into the mud as they carried the heavy metal out to sea at low tide. “And of course it was raining,” Gowdy laughed. “When Malcolm’s up there on the tower, he’s all alone – but the preparation for the performance was truly a collaborative process,” Gowdy said. Gowdy had watched the performance practiced back in Louisiana and seen McClay’s sketchbook of his vision, which is riddled with precise drawings, intricate details of a complex project. So she thought she knew what to expect. The day of the performance was windy and crisp, waves rolling in with force. McClay rhythmically built the tower, the tides rushing in ominously. Students and onlookers watched from the shore, his white-clad body a winking speck against the horizon. 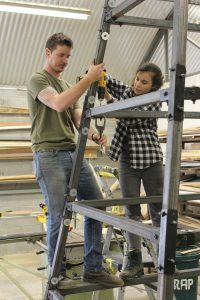 He stood at the top of the tower as the water rose around him, his bucket of tools close at hand to secure another length of steel. A solitary figure in white, surrounded by the incredible blue-green ocean. As the day progressed, an offshore wind grew increasingly stronger until the waves were pounding the tower, and he was leaning into the wind during his standing meditation, at the mercy of the elements. He was out in the sea for six hours – at the halfway point, his wife Chicory Miles played the violin, the melody wafting out toward him. By the end the tide had climbed so high that it looked as if he was standing on the surface of the sea, a lone man floating over the water. Just as McClay finds focus in the rhythmic activity of swimming through the biting cold sea to the island of Inishkeel, so did the art students find focus – on the art they were creating, on understanding themselves – as they became absorbed in the wild beauty of the Irish coast. In this place, they find the thin space of transcendence. 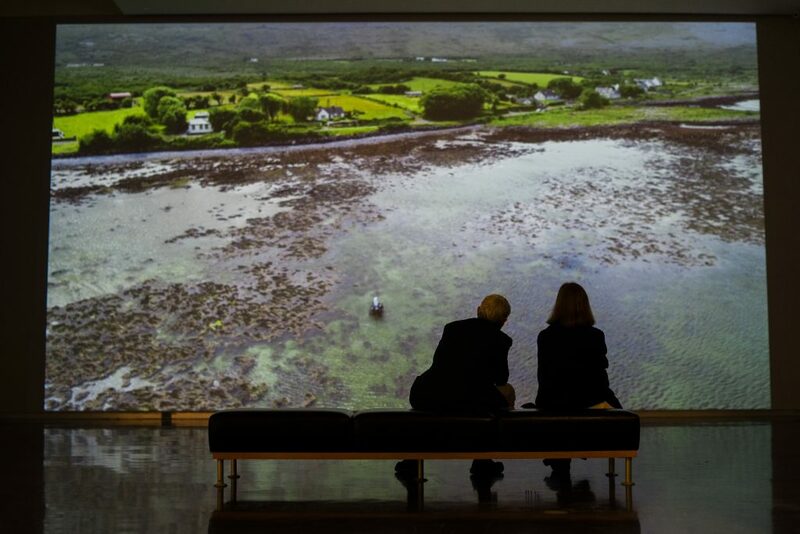 The Swimming to Inishkeel exhibition is at the LSU Museum of Art through February 10, 2019.